Hamden, Conn.-based Quinnipiac University has experienced steady growth in recent years which necessitated expansion beyond its main campus. This expansion comes with the need to provide additional security for university personnel, as well as the nearly 8,000 students that live in campus residence halls. Securing buildings located in remote off-campus locations can be a challenge for a school’s facilities department. 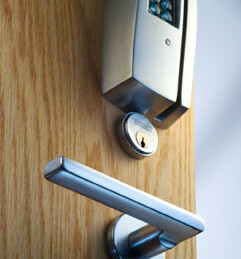 Quinnipiac overcame this by installing WiFi-enabled locksets from Sargent Manufacturing, one of the brands of ASSA ABLOY. “Even though we expanded outside the main campus, we wanted to provide the same level of doorway security that the main campus enjoys,” said Keith Woodward, director of facilities at Quinnipiac. Quinnipiac has a more than 30-year relationship with Sargent and ASSA ABLOY. All residence halls and academic buildings on the main campus are secured with Sargent Passport 1000 PG offline locks that operate with Quinnipiac’s Q-Card student ID program. The locking system’s Persona Campus software enables the university to set access privileges on all campus buildings and track lock usage with an audit trail feature. Facility personnel wanted to offer this same access control to 400 doors on off-campus buildings without having to send out a technician anytime a lock required enrollment updates. A solution was available in the new SARGENT Passport 1000 P2 lockset that connects wirelessly to the school’s security network. Using an existing WiFi network, the Passport 1000 P2 connects as often or as little as specified to maintain its local list of up to 2,400 users. With the new locks, Quinnipiac was able to simplify management of their off-campus access control so it can be used with campus IDs. In addition to opening their doors, the cards are used for meals, laundry, vending machines, copy machines, checking out books and equipment, and accessing the fitness center. There is also an off-campus program and the cards are accepted by a number of local merchants.